Only the greatest place to visit in Florida! We have had some glorious adventures with Gatorland and continue to create all kinds of signs, murals and artwork for the park. If you have never been, do yourself a favor and stop by soon. Halloween Horror Nights, multiple years, houses, props, staging and sets. Multiple restoration projects at Universal Orlando, Escape Rooms, custom furniture and a multitude of fabrication, scenic paining and incredible people! Troy and the guys at Red Eye Concrete have been with me from the start. Soo many cool project completed and in the works with my concrete family. Check them out! Ben at BCA and I try to find as many reasons to work together and it’s never enough. He’s usually very busy creating incredible custom rooms and art and just being cool. 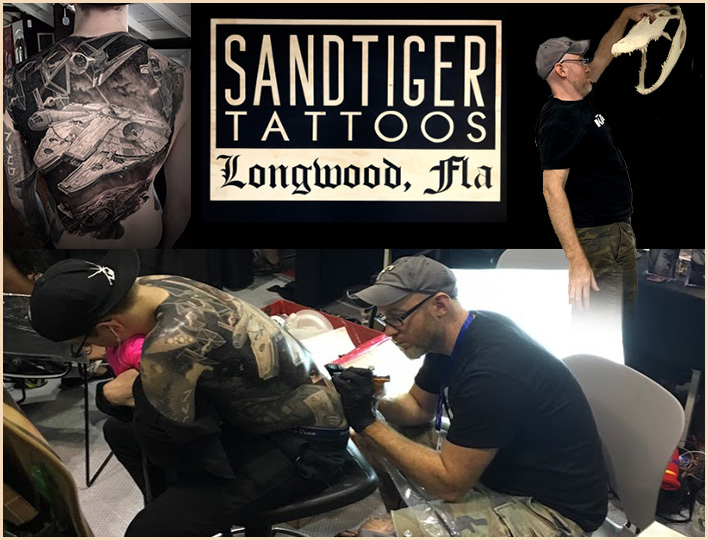 The Owner of Sandtiger Tattoos, my close friend since 1998, one of the best artist I know. Phil creates these pencil and airbrush pieces on Skate decks that you have to see.